We work alongside the artist, developing an effective strategy for communicating with the organizers. Constantly collaborating with the artist, but at the same time allowing the artist to devote exclusively to music. 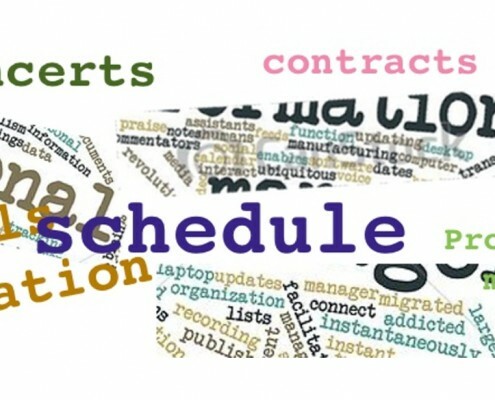 We organize your concert schedule, draw up contracts, and we also plan your agenda. Hotels, transfers, flights, … all perfectly coordinated with organizers and supplying the artist with all the necessary details and any relevant information required. We take care of all the maintenance concerning your Facebook account, Youtube Channel and Web sites. We prepare digital equipment, as well as promotional videos and advise the artist on how to direct his/her image. We can create an individually tailored project solution for you!